"Seeing that full moon, heralder of the white night lilies... Krishna played his flute softly, capturing the hearts of the beautiful-eyed women..." Detail from the Krishna Lila, ca. 1765. After all sad events lately, I just felt giving a small treat for myself. Little did I guess that my choice of a treat, visiting the "Garden and Cosmos: Royal Paintings of Jodhpur" exhibition at the Seattle Asian Art Museum, would be such a feast for my eyes and mind. 60 beautiful and unusual paintings, painstakingly painted in opaque watercolours and gold with fine brushes made of squirrel's tail hair, from the royal ateliers of the kingdom of Jodhpur-Marwar, in what now is Northwest India. Detail from Maharaja Bakhat Singh Enjoying the Gardens at Nagaur, 1737. The paintings, that have never seen before in the west, display not only scenes of luxurious life in the palaces and their gardens, but also include a mystical series created for a 19th-century ruler who turned over political power to an ascetic sect. 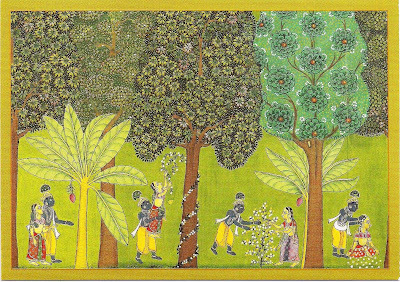 As a short introduction to the exhibition tells, "the paintings reveal the emergence of a delightful and sensuous garden aesthetic in the 18th century, as well as a dramatic shift in visual consciousness in the early 19th century, when an amazing series of large images exploring esoteric yoga philosophy, unprecedented in Indian art, led to a sublimely minimal aesthetic." Reading all the explanations and texts on the exhibition walls made me reflect over my shallow knowledge about the highstanding, old culture of India with its different regions and religions, and I truly felt my own shortcoming in this area (I browsed the extensive and well-illustrated, 325-page catalogue, but decided that $40 was a bit too much to invest just now). But still, the refined and luxurious paintings talked their own language, that I can deeply admire. As a garden person, I really enjoyed the details of the gardens that these paintings show; most of the paintings are quite large, about 1m (3-4ft) wide and high, so the amount of work that has gone to painting them is incredible. Inside large walls there are geometrical flower beds and water rills with fountains. Outside the palaces are gardens with fruit trees with different kinds of colourful birds and different kinds of animals; large ponds are filled with with ducks and fish. 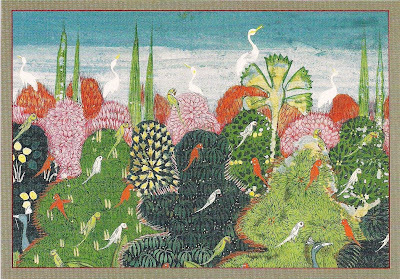 Everything is painted in amazing detail, one can see the feathers of the birds and individual leaves and flowers of the plants, as the gardens and the surrounding landscape are depicted as a pleasure ground for the maharajahs and the gods. Naturally, they also are a symbol for the status, power and refinement or the maharajahs and their courts. If I have something to wish, I just would have hoped for more detailed information about the gardens and their contents; What were the main elements of these gardens, and what were their origins and meanings? Could any plans of them have been exhibited, as many or the paintings depict real gardens? What are the plants and flowers in them and what do they symbolize? In some paintings there are vegetables and flowers used as offerings; which plants are they and what were their meanings? I know that some of this probably is considered "too horticultural" for an art exhibition, but I still think that many visitors would very much enjoy such information. Maybe including botanical/horticultural and garden history expertise in future exhibitions, when garden related art is included, would be an interesting idea? 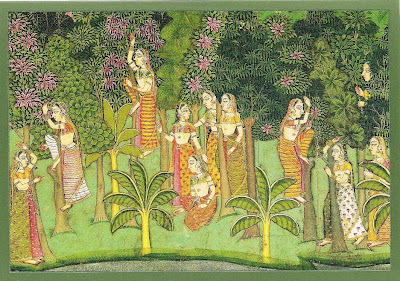 "Singing loudly to himself, (Krishna), wearing a garland of flowers, frolicked in the forest...", detail from the Krishna Lila, ca. 1765. These paintings were created to be shown one at a time for the maharajah(s) lying down on soft pillows. Trying to take in all 60 of them at one time gives a totally different experience, and the royal painters surely would not have thought this was a suitable way to enjoy their art. Reluctantly leaving the exhibition, I felt almost drunk by the splendour and colour, and thankful for having experienced this great, but small glimpse of the old Hindu culture of Jodhpur-Marwar in India. 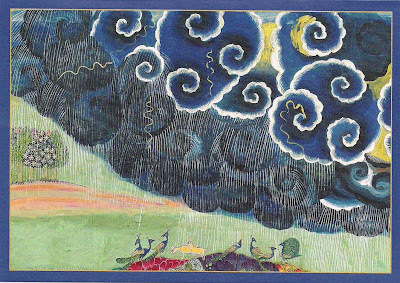 Probably totally illegally, I scanned in some postcards of the paintings. Some of them are shown on-line at SAAM web site; if you zoom in you can catch some of the very fine details of the paintings. I've been wanting to visit this exhibit. Thanks for the preview. They look like lovely scenes, definitely a worthwhile treat. Happy Gardening. Thanks for doing the "ILLEGAL" AND POSTING PICTURES. I LOVE THE SHOW AND WILL RETURN . Önskar att utställningen kom till Sverige också, åtminstone Europa, men i väntan på det, så njuter jag av dina inscannrade bilder. Såå vackra. Jag och några vänner åkte till Indien för ett par år sen och besökte en del formella vackra trädgårdar, bland dem Taj Mahal och i Jaipur (men önskar att vi hade kommit så långt som till Jodphur där det finns mängder av vacker natur och byggnader) Trädgårdarna vi såg, påminner om de italienska trädgårdarna med kvadratiska och rätvinkliga rum fyllda med blommor. Det var en stor upplevelse. Men det stora resmålet för mig n d g trädgårdar är USA. Vill jättegärna ha tips på fina trädgårdar i Kalifornien. Tack för din kommentar på min blogg. Ha det gott. Vad kul Trädgårdsturisten; Indien ligger verkligen på min topp-lista. Jag ska maila dig lite trädgårdstips, jag håller på min egen research just nu så vi kan ju dela på kunskapet! Ha det bra.